Bag: Or bucket. Anything that will transport your leaves from the forest to the kitchen table. Leaves: All different colors, shapes, and sizes. Sharpie: Only needed if you want to write names on them when finished. 1. Head to your favorite local haunt with lots of trees and start gathering. We decided to use our project as a hiking opportunity as well, and headed over to the Big Rocks Nature Preserve. 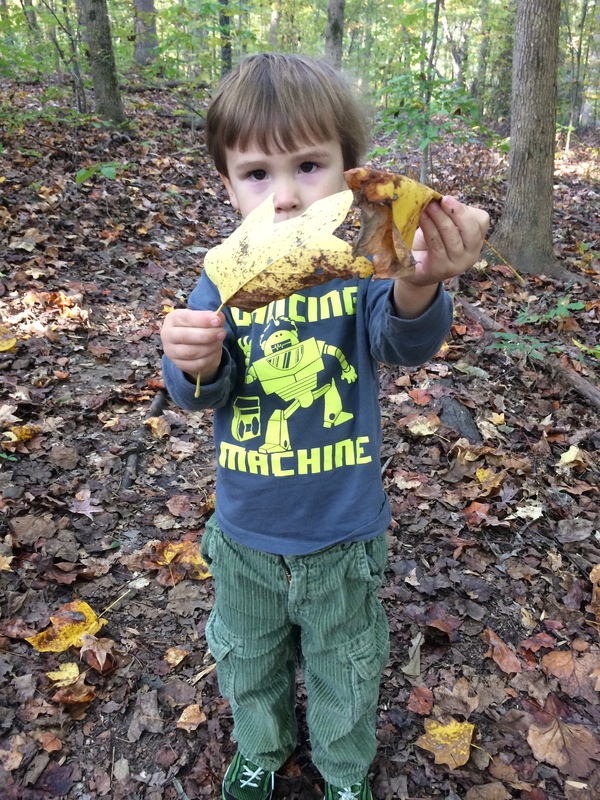 C enjoys hiking a lot better when he has a “mission” – gathering leaves, looking for bugs, etc. But if you’re short on time, you can probably score almost just as many around your neighborhood! Don’t be picky – the more variety, the better the collage! 3. Peel off one piece of contact paper and lay it on the table, sticky side up. I was afraid this could get frustrating, with everything within 10 feet of the paper getting stuck, but it was actually not bad at all. It’s relatively easy to “unstick” something that inadvertently lands on the paper, or to reposition something exactly how you want it. 4. Creatively place leaves onto the paper. Let your toddler’s imagination run wild! The nice thing about this project is that it will always look great because there’s no wrong way to do it! 5. 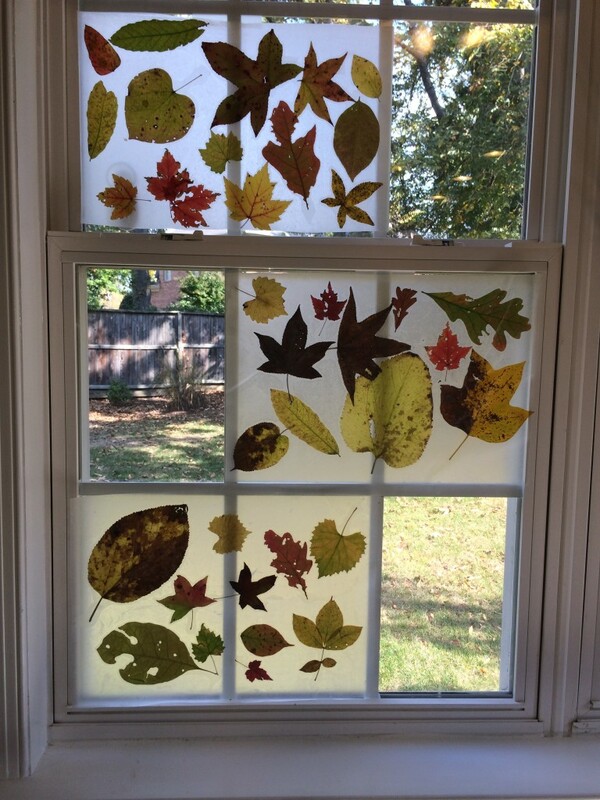 Peel off the other piece of contact paper and carefully lay it sticky side down on top of the leaf-laden paper. You may have to peel up each corner and smooth out with your hand a few times in order to get ride of unwanted air bubbles and creases. That’s it, you’re done! Now you’ve got a beautiful placemat that you can enjoy all season long! We made three – one for C, one for Mommy, and one for Daddy. We ended up liking them so much that we decided to hang them on the windows while they are not in use. The sun shining through the paper made for a beautiful effect! If we get really inspired, we may even make the entire extended family personalized placemats for Thanksgiving. It would be a great way for C to get involved and be able to bring something to the table (literally!) Has anyone else ever tried making these? (If you haven’t, you should, it was loads of fun!) 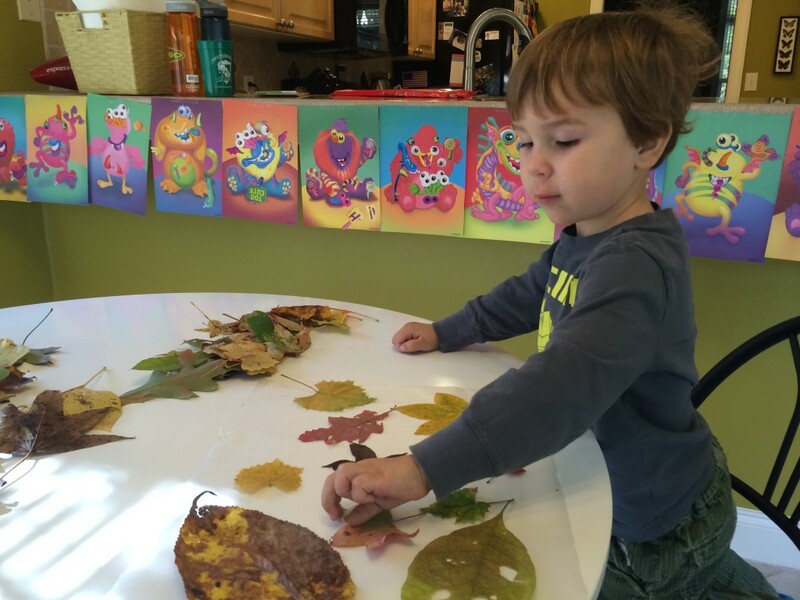 What are some other autumn leaf crafts that are fun for the whole family? 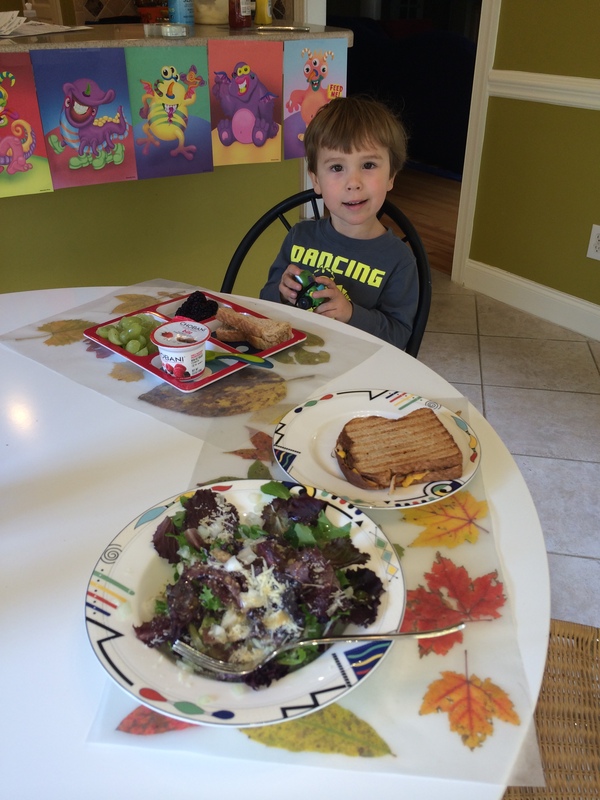 Enjoyed this post and particularly liked the idea of making the placemats into wallpaper. I need to put this on my idea list for earlier in the season for where we live. The leaves have fallen and the wind has wept them away. (We live in NE which is ranked fourth in the wind energy potential – it’s always windy here.) Snow is projected for today. I used to make these with my mom every fall except we had to use wax paper as well couldn’t buy/find contact paper in our small town. I remember it being such a fun project. 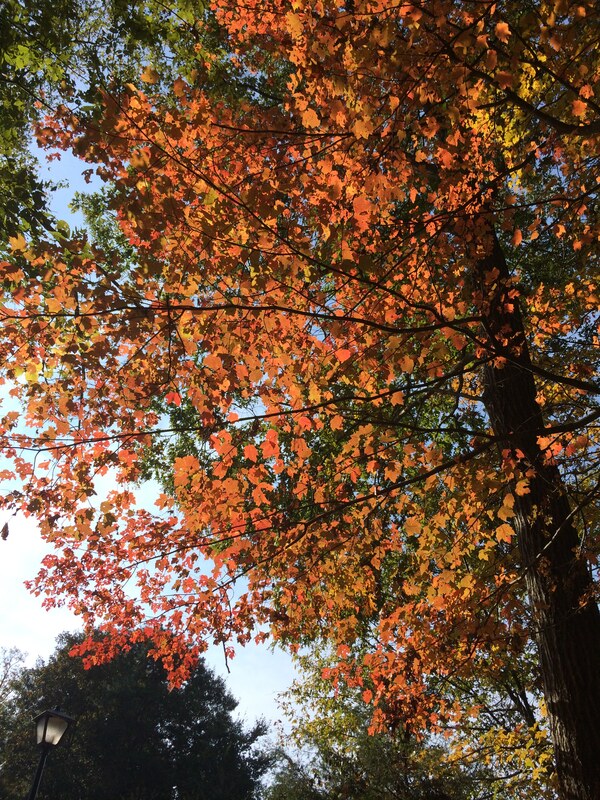 Audra – Yeah we’ve had a few windy days of late and that’s done a number on our fall color in the trees!